Lately, I hav started Poppy Seeds a lot. Poppy seeds can be a great food-enhancing ingredient for breads, cookies, rolls and cakes, but that is not all it can do. Throughout history, the powerful little food ingredient has been found to have many health benefits and medicinal benefits. If taken properly, they could serve as a healthy alternative to common ailments. Because they are storehouses of opium, the seeds are often used as an ingredient for preparing various herbal medicines. For more information, see the Benefits of Poppy Seeds here. I have used Orange Juice in this bread. I have seen that whenever I use Orange Juice in the cakes or breads, the texture comes out beautifully. The slightest hint of tang it provides to the bread, is amazing and mixes up very well with a lot of other ingredients. Also the texture is quite better than using plain water. Stir together flour, sugar, baking powder, salt and baking soda. Cut in butter and mix with your finger tips until crumbly. Add the beaten egg and orange juice. Stir until just combined, do not over mix. Now fold in dried cranberries and grated orange zest, if using and mix gently. 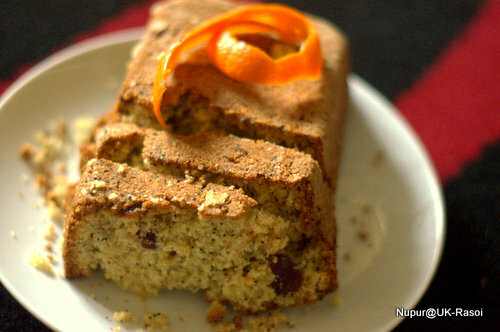 Have not used poppy seeds in anything other than modak’s … should try this one, looks so tempting esp those cranberries!! wooo hoooooooo,…………awesome ! looks absolutely divine nupur! cranberry and orange ……both my favs! smack! Very flavourful and tempting…loved the ingredients used..nice and delicious!!! This cake looks delicious and the pics are gorgeous! Wow Nupur this looks yum. This si something that i will like to try. Never thought of using poppy seeds in breads/ bakes. Thanks for linking it to Bake Fest.